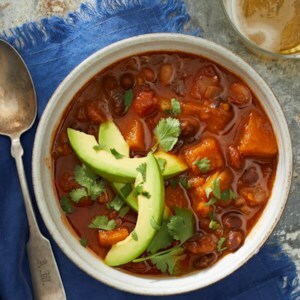 Find healthy, delicious easy slow-cooker and crockpot recipes, from the food and nutrition experts at EatingWell. 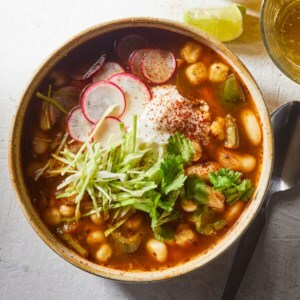 Healthy slow-cooker recipes that require no advance preparation. 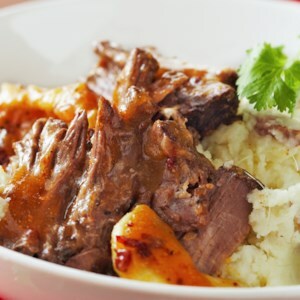 The sauce on this slow-cooker pot roast is a tantalizing combination of sweet and smoky. 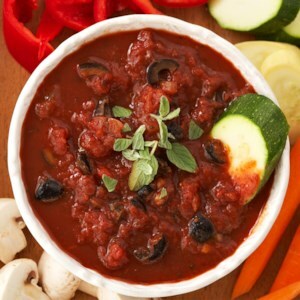 Dried fruit and chipotle peppers combine with garlic-pepper seasoning to create a thick and tasty sauce that perfectly coats the meat and mashed potatoes. Fruity mango chutney, zesty barbecue sauce, and a bit of curry powder are the secrets to success in this slow-cooker chicken recipe. 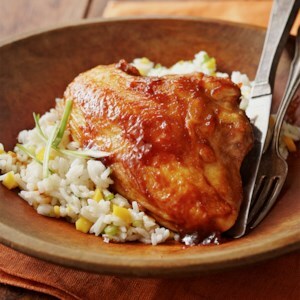 They combine to form a delicious glaze on the chicken, which is served over a brown rice and fresh mango mixture. This slow-cooker pulled pork recipe is perfect for meal-prep weekends. Freeze all of it for future meals (like our Shredded Pork & Green Chili Roll-Ups; see associated recipe) or serve it right away in a toasted pork sandwich. While you're focused on every other dish for the backyard barbecue, let the slow cooker make cherry cobbler for a crowd. With frozen fruit, this easy slow-cooker dessert can be made and enjoyed any time of year. 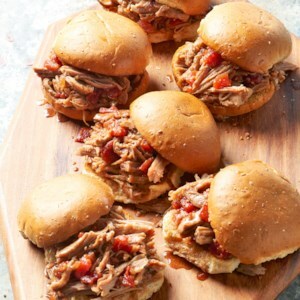 Boneless pork shoulder shreds easily after spending ten hours in the slow cooker. 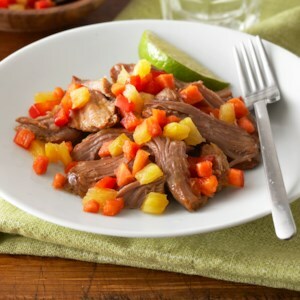 A fruit relish served with the cooked meat offers tropical taste to this entree. Serve it alone, or with warmed corn tortillas. This Mexican-inspired meal is an easy crowd-pleaser. 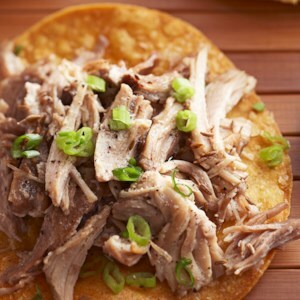 Savory pulled pork is served atop crisp corn tortillas and topped with sour cream and salsa in this simple slow-cooker recipe. 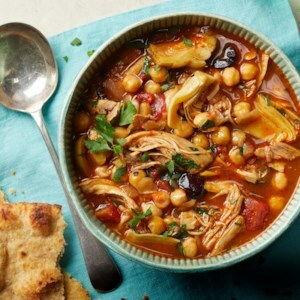 This set-it-and-forget-it slow-cooker recipe simmers away all day so you come home to a warm and healthy dinner the whole family will love. 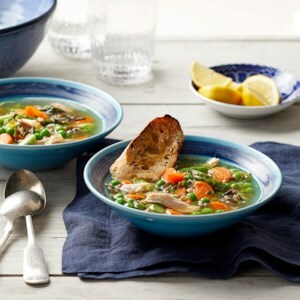 Using bone-in chicken is the key to making rich soup without adding broth. This taco recipe is a great choice for midweek dinners, even if it's not Taco Tuesday! 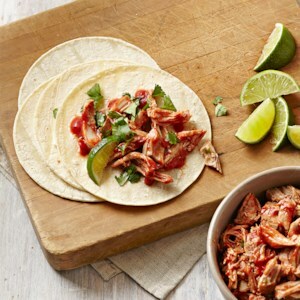 Instead of beef, we use moist, boneless chicken thighs and to make things easier for you, the taco filling is cooked in a slow cooker, so you can prepare it in the morning and come home to a delicious meal. After searing the steak on the stovetop, you can sit back, relax and let your slow cooker do the rest of the work. 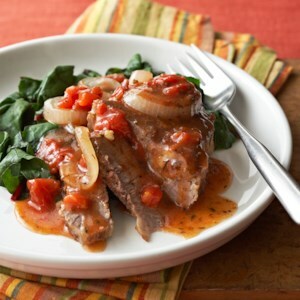 Make it a meal and serve this Italian-inspired steak recipe over hot chard or rice, if you'd like. 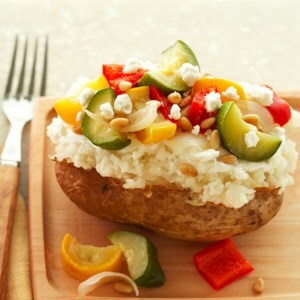 These slow-cooker roasted potatoes are bursting with colorful vegetables, mild pine nuts, and tangy feta cheese. Serve as a side with steak, or add some beans and make it a vegetarian main dish. 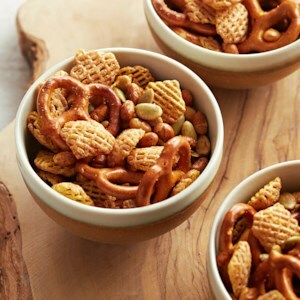 With both sweet and spicy flavors to entice your taste buds, this slow-cooker-prepared snack mix is easy to make and great to have on hand for game days, parties, and after-school snacking. Remember to stir it every so often, as directed, to keep things from sticking together. Let your slow cooker work--while you're at work!--and come home to a delicious bowl of hearty stew for dinner. 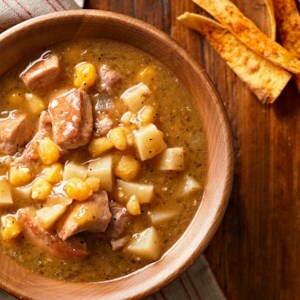 Full of potatoes, hominy, green chiles, and chunks of pork sirloin, this filling stew recipe takes just 25 minutes to prepare in the morning. Chicken wings are great for game night and a perfect appetizer for a party, but don't get stuck in the rut of always serving BBQ wings. 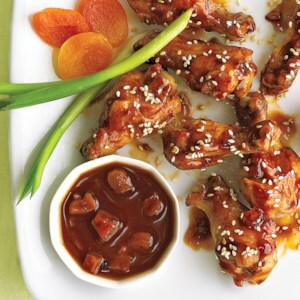 Add variety to game nights with this easy slow-cooker recipe for Thai wings with peanut sauce--and BBQ wings may just become a thing of the past! 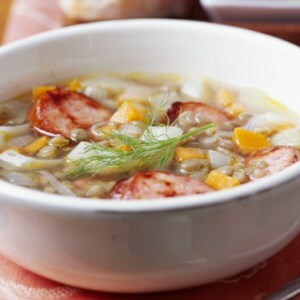 Smoked turkey sausage adds incredible flavor to this easy slow-cooker stew recipe which is full of iron- and protein-rich lentils. 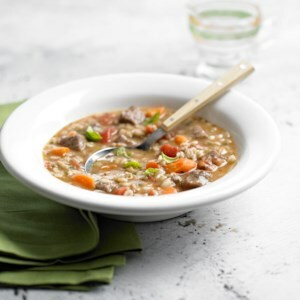 There's something so satisfying about a hearty bowl of beef and barley soup--especially when it's one you've made from scratch with reduced-sodium broth and chunks of delicious sirloin steak. 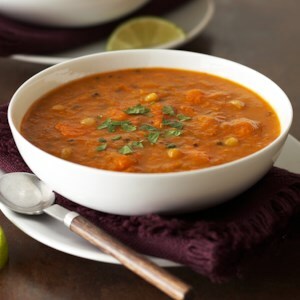 This slow-cooker recipe is simple to prepare, serves six, and is a great alternative to canned soup!